Today we have collected the most stylish set of icons deals from the best deal for designers websites. Icons are an essential part of every design project. Stilish icons can boost the creativity of the pages you are designing. They can give personality to your project and make your pages unique! In fact icons are so important as photos in a web page. If you have great photos your pages improves their quality and if you have great icons too. Sometimes you do not have enough time for finding new icons during the development of a project and for this reason it is very important to have your set of great icons ready to use. That’s way today we have collected some set of great icons deals for you. Do not just think about the project you are working on now but think about how this icons will be usefull for your future projects. All the icons set comes with psd files (and of course png) to let you easily modify them or change their colours. They are all vector icons so that you can also modify the dimensions without losing quality. So let’s start with this stylish collection of icons deals. Enjoy! Ballicons: 110 Unique Flat Vector Icons Deal – only $11! The Ballicons collection features 110 flat icons deal in a variety of popular categories from food to travel to shopping! Highly colorful and customizable, these professional, high-quality icons come to you in multiple file formats, giving you total control over their final appearance. And if you really want to go ballistic, wait until you hear the price… Yep, you can get all 110 Ballicons for only $11! That’s like paying just 10 cents apiece! 510+ Unique & Professional Flat Style Icons Deal – only $6! You’ll get more than 510 flat style icons deal from EpicCoders at an already low price that’s been flattened even further for you. For a limited time, you can save 50% off the regular price! So get to reading and you’ll be ordering these in… well, in no time flat! 1,200 Professional Vector Icons Deal from PixelBazaar – only $24! Well, if you need to add some icons to your site, you’d certainly benefit greatly from an icon collection! This bundle, from PixelBazaar, features 2 different versions of the same icon set, containing 600 pictograms apiece. That’s a total of 1,200 high-quality professional icons to add to your site. What’s more you can take home this beautiful bundle for a limited time at a 60% discount! You don’t need a special icon to tell you to jump on this deal now, do you? 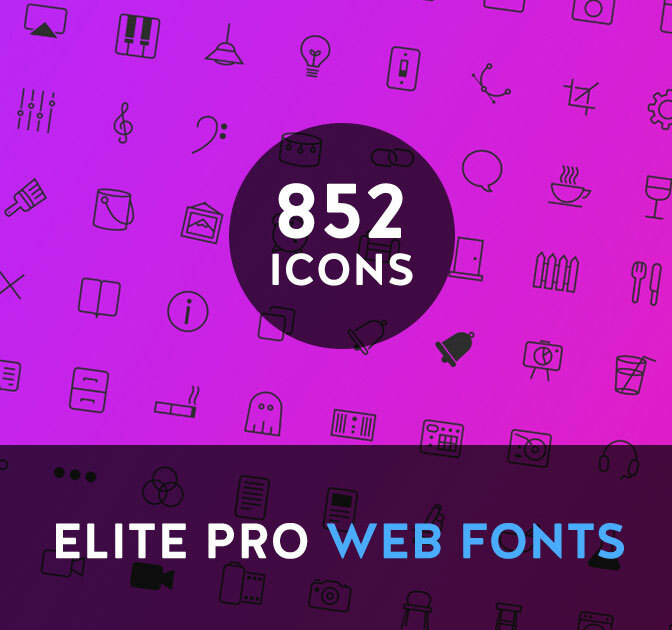 Elite Pro: 850+ Vector Icons Deal Usable As 13 Premium Web Fonts – only $29! Besides including 852 high-quality, professional icons spread out over 13 different categories, this collection includes the most popular icon sizes. If you need a smaller or larger size for some reason, that’s easy to customize through the original files. However, the coolest of all, this icon set is also a collection of web fonts, so you can simply use basic CSS to control how they look on your site, no images necessary! The only thing not elite about this deal is the price. Yeah, just $29 gets you this incredibly versatile and useful icon set! Bundle of Bundles! 2,500 Vector Icons – only $37! This isn’t just a regular old icon bundle. Nope. This is a bundle of icon bundles! In fact, you’ll have so many icons to choose from, you’ll want to create hundreds of different Web and mobile apps just so you can use even half of these! Specifically, this monstrous bundle consists of 3 huge icon bundles, for a total of 2,500 vector icons! Click on the butto below to find out more of this great collection! 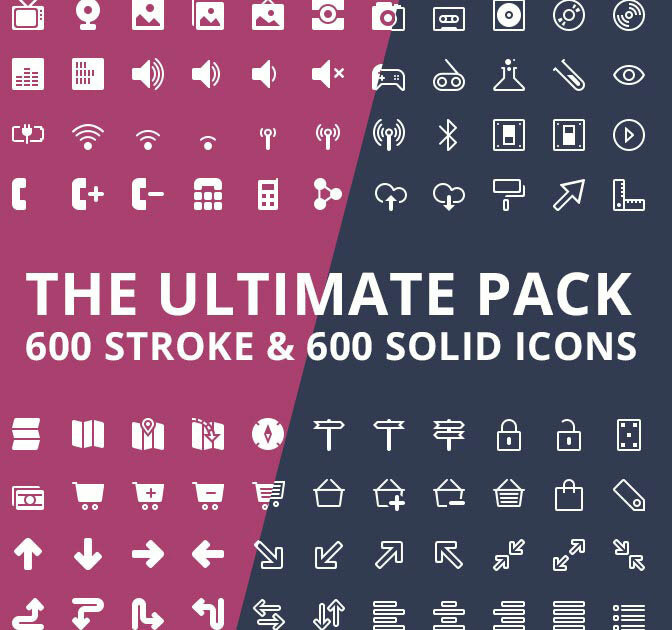 This bundle of icons come in SIX different sizes: 16, 24, 32, 48, 64 and 128 pixels! On top of that, you will also receive a vector version for Adobe Illustrator, Adobe Photoshop and CorelDraw. Each icon has been carefully created to have crystal-clear edges, because top quality designs can be achieved only with top quality resources. Because these icons are 100% vectors, you can easily resize them; change their color, shape or anything you can think of! Deals for designers: check the latests!